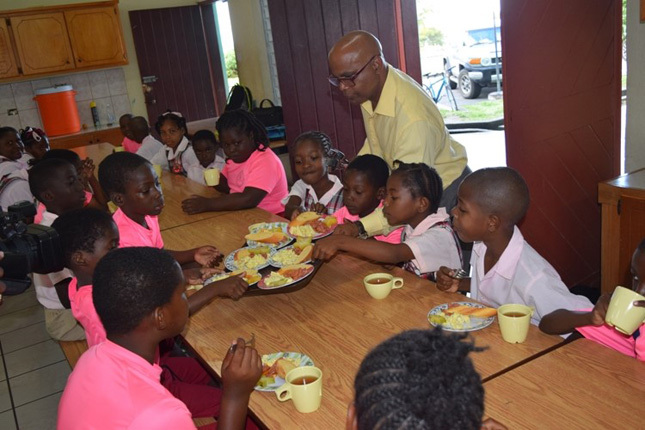 Basseterre, St. Kitts, March 20, 2019 (SKNIS): Over the past two years, students of the Tyrell Williams Primary School have been receiving a well-balanced breakfast, thanks to the efforts and generosity of the Honourable Lindsay Grant, Parliamentary Representative for Constituency #4. The programme runs every morning from Monday to Friday, said Minister Grant. He added that it has been designed to satisfy around 75 students per day. The minister said that the breakfast usually starts off with bush tea, and the wholesome meals consists of sausages, eggs, sardines and bread. He said that the programme came about when he was approached by teachers who explained to him that some of the children were arriving to school without having breakfast. The teachers said that those students were having a hard time during the day. Over the course of the next two weeks, the programme will be catering to 100 students per day, said the minister. As a result, two stoves and a refrigerator were purchased, said Minister Grant. “So, we are going to start producing the breakfast on the site here at the kitchen at the Tyrell Williams for the just about 100 students in the next two weeks,” he said. The minister stated that this is a yeoman’s service and thanked the principal and staff of the Tyrell Williams Primary School for allowing the programme to thrive. “I think that it will auger well with the students in this community,” he said. Minister Grant stated that seeing the success of the programme, the Verchild’s High School has reached out to him to have it replicated there for about 25 of its students.